There are several characteristics that set the Arabian horse apart from other breeds, the most noticeable being their face. "The Arabian's head has a characteristic dished profile with a prominent eye, large nostrils and small teacup muzzle (Byford, et al. 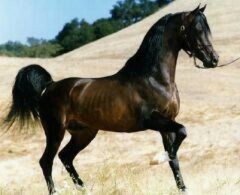 Origination of the Arabian Breed)." Arabian horses are well known for being affectionate and bonding well with humans. Arabians have also become the breed of choice in the endurance world because of their stamina and agility. Due to their friendly nature and willingness to work, Arabians are a popular choice for instructional programs and therapeutic riding. It is unknown whether the Arabian was first needed for work or riding, but by 1500 B.C. the people of the Middle East had domesticated the Arabian horse. In 1725, Nathan Harrison of Virginia imported the first Arabian stallion into the American colonies. In 1873, General Ulysses S. Grant was given two purebred Arabian stallions, Leopard and Lindentree, on a trip to the Middle East by Sulton, Abdul Hamid II of Turkey. Leopard was then passed to Randolph Huntington, who then imported two more stallions and two mares in 1888 from England. This became the first purebred Arabian breeding program in the United States. On September 2, 1908, the Arabian Horse Club of America, Inc. (now called the Arabian Horse Registry of America), was founded in New York State. It is now located in Colorado. Arabian horses come in many colors, grey, chestnut, bay, roan, brown, and occasionally black. Most Arabians stand between 14.1 and 15.2 hands and weigh between 800 and 1,000 pounds as adults. Read the next horse breeds article on Clydesdale Horses.